A dream of Aug.2011 that is starting to come true. Hello this is Constantine 1959 this is going to be my last video. 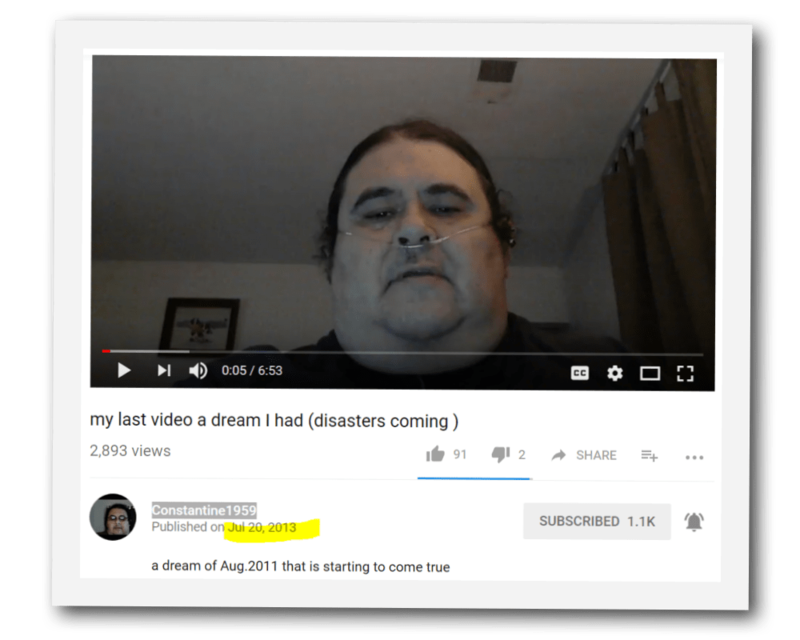 I was talking renamed my videos so you understand what’s in them instead of all being called prophetic dreams and visions. This is one I need to remake. I had a dream on August 2011 I saw a large earthquake hit California. Part of it broke off and around the edges turn into sand and they made like an island. Then I saw earthquakes hitting all over the whole world. They kept getting larger. Most of them were seven (magnitude ) or bigger. Volcanoes were erupting all around the world. I saw a black fill smoke and clouds fill the air. I saw lava flowing out and down the mountains. The closer we get to tribulation the more disasters, famine, drought and pestilence will be happening. I saw two planets were behind the Sun. One larger than the other. In August I saw that it was going to be slow which it is we are shifting a little at a time and then all of a sudden we’re going to get to a point and it’s going to flip quickly. I have seen a tsunami hit the east and the west coast I don’t know if it’s because of the ….. but I know they happen. The dreams started rapidly changing at this point tornadoes will be almost all year long instead of seasonal. I have seen freak weather storms and other dreams happen at weird times of the year at places never before . There was no ….in the summer and heat waves in the winter. I saw the drinking water go bad in towns where we have to boil water to drink and the cook . I saw USA and eight countries fight against them. This will be the world war three and it will be fought mainly in the US. There was some fighting abroad. I was told they will split my children’s Land of Israel which if you have been listening to news lately they say they’re already starting to do that in the UN that starting this weekend. Some of Israel may not be considered Israel. Father will has warned us if you split up Israel He will split up your land as well. Even after they take the land they will not have peace in Israel. Palestinians will say that 1947 borders is not enough. Father says that their words are empty. In the dream I saw no food in the stores or water to drink. People who are raiding surrounding farms and ranches for food. They were even stealing the fruit and vegetables. They were killing the livestock for meat then I saw government-run stores food stores not people owned stores anymore. You must have the New World Order card to buy food when they decide the card will be no good anymore then it will be required to get the mark on the right hand. In the dream I saw the mark first as a chip and then as a tattoo on top of it. No food will be given without a card at first then the mark. The Food lines were miles long. Father said tell them come back now before it’s too late before my wrath comes to your land. I love all my children I will forgive you and put your name in the book of life if you come back soon. This is my last video. 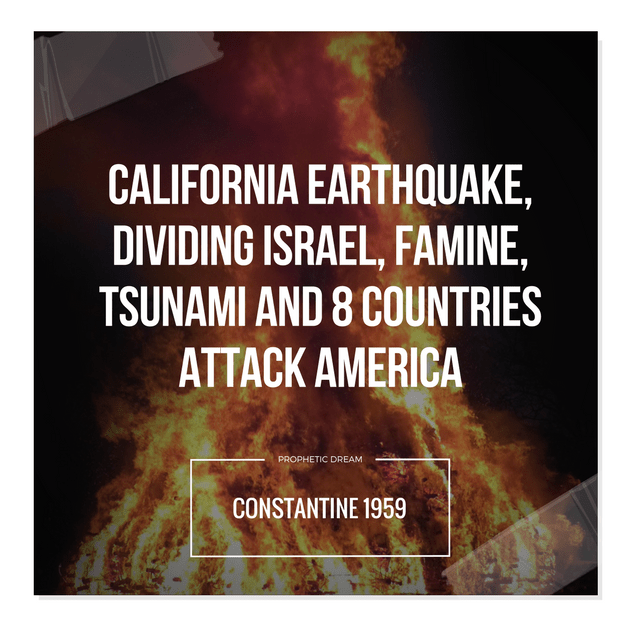 This is Constantine1959, Thank you for listening.